Notes: Vol 25, No 4. 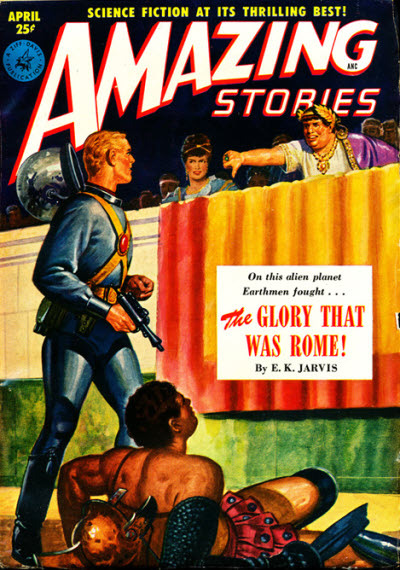 Cover illustrates "The Glory That Was Rome!" Credits for one illustration in the Table of Contents is given to "Enoch Sharpe" but illustrations are signed "Sharp." Credit changed to match signature. It is speculated in some sources that David Wright O'Brien is responsible for all Clee Garson stories but one. The source used by the editor who originally made the attribution of the story in this issue is not known and the attribution could not be verified. The author of "The Maritan Rockett" is misspelled "Merritt Linn" in the table of contents.